It may be the biggest attraction to hit Wichita since Charles Lindbergh flew in more than 50 years ago. 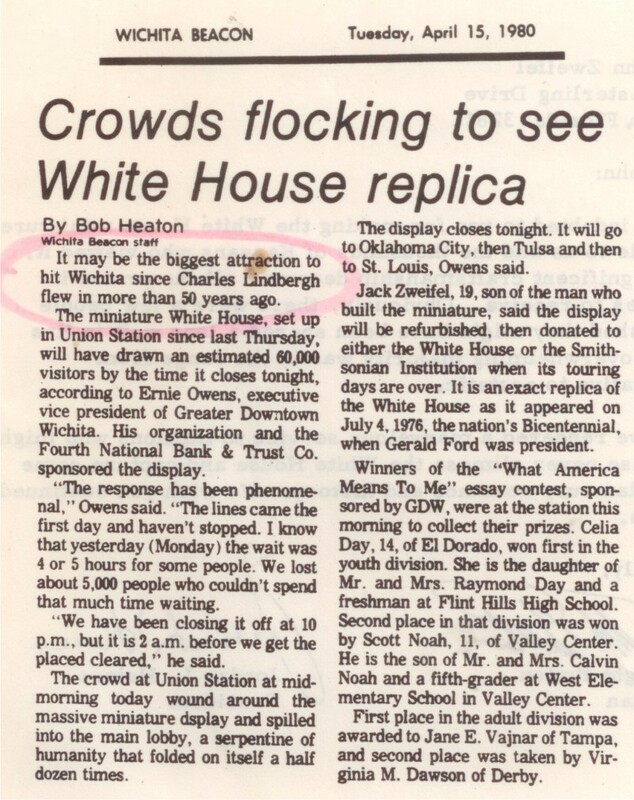 The miniature White House, set up in Union Station since last Thursday, will have drawn an estimated 60,000 visitors by the time it closes tonight, according to Ernie Owens, executive vice president of Greater Downtown Wichita. His organization and the Fourth National Bank & Trust Co. sponsored the display. "The response has been phenomenal," Owens said. "The lines came the first day and haven't stopped. I know that yesterday (Monday) the wait was 4 or 5 hours for some people. 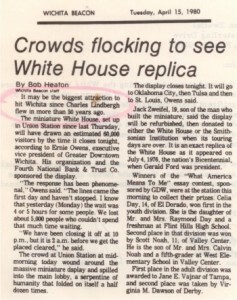 We lost about 5,000 people who couldn't spend that much time waiting. "We have been closing it off at 10 p.m., but it is 2 a.m. before we get the placed cleared," he said. The crowd at Union Station at mid-morning today wound around the massive miniature display and spilled into the main lobby, a serpentine of humanity that folded on itself a half dozen times. The display closes tonight. It will go to Oklahoma City, then Tulsa and then to St. Louis, Owens said. Jack Zweifel, 19, son of the man who built the miniature, said the display will be refurbished, then donated to either the White House or the Smithsonian Institution when its touring days are over. 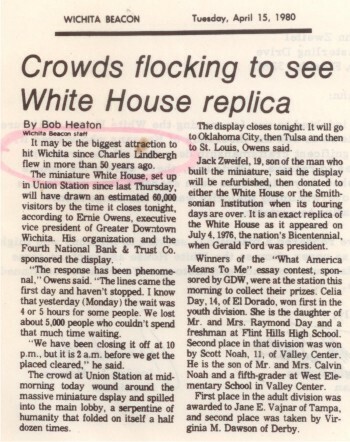 It is an exact replica of the White House as it appeared on July 4, 1976, the nation's Bicentennial, when Gerald Ford was president. Winners of the "What America Means To Me" essay contest, sponsored by GDW, were at the station this morning to collect their prizes. Celia Day, 14, of El Dorado, won first in the youth division. She is the daughter of Mr. and Mrs. Raymond Day and a freshman at Flint Hills High School. Second place in that division was won by Scott Noah, 11, of Valley Center. He is the son of Mr. and Mrs. Calvin Noah and a fifth-grader at West Elementary School in Valley Center. First place in the adult division was awarded to Jane E. Vajnar of Tampa, and second place was taken by Virginia M. Dawson of Derby.